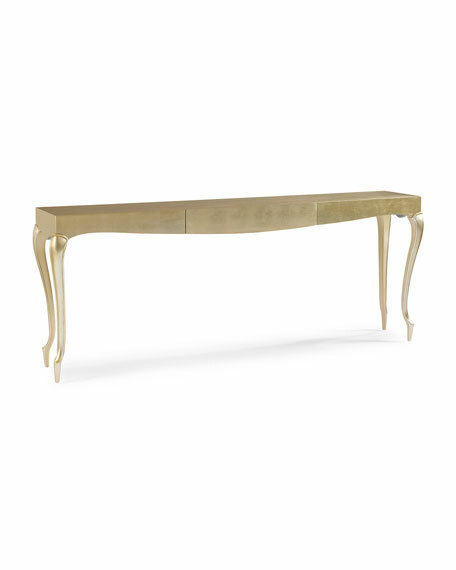 We love an elegant statement at Caracole and Gold-y surely knows how to make one. At 79-inches in length and a mere 15-inches deep, this gem is beautifully proportioned. Use in a narrow entrance hall or behind a floating sofa  Gold-y is finished on all four sides, to stand out or stand alone. Our Gold Highlights finish is hand-applied using a time honored technique. Featuring one hidden drawer, in the center of this rare beauty's curvaceous expanse, you can hide away keys, cocktail napkins or other well-kept secrets. Overall, 79"W x 15"D x 31.3"T.